Dainese Full Metal D1 Gloves Race bred and born for the track, the Dainese Full Metal D1 Gloves carry a CE rating, incorporating all of the same great features found in the Full Metal RS but reinforced with more leather and extra DuPont™ Kevlar® stitching. 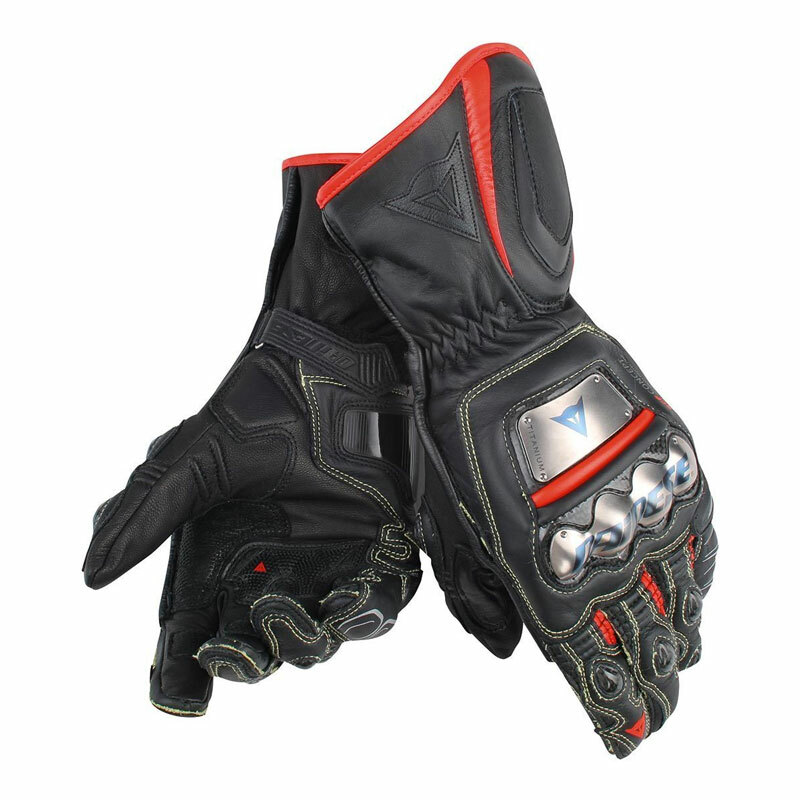 Elasticated inserts, carbon fiber and titanium knuckle/finger sliders, DuPont™ Kevlar® lining and Dainese's Distortion Control give these unrivaled levels of protection while providing seamless mobility and feedback. Purpose built for the most competitive Moto GP level racing conditions, the Full Metal D1 gloves are designed to give you an edge on or off the track. Protection: Composite inserts in carbon and titanium on the knuckles and back. Carbon inserts at the joints of the fingers and the head of the ulna bone. Polyurethane insert on the palm. Distortion Control on little finger. Thermoplastic resin in inserts on side of little finger. CE - Category 1 - 89/686/EEC Directive. Main Materials: DuPont™ Kevlar® jersey. DuPont™ Kevlar® fiber stitching. Cowhide leather. Leather palm reinforcement. One single leather panel to the size of the hand. Ergonomics and Comfort: Adjustable cuff strap. Tightening strap. Elasticated inserts on the back of the hand. Micro-injection reinforcement on palm. Pre-curved fingers. Palm Super Touch in goatskin. Perforation on inner side of fingers. Other Features: Soft inserts.